he smartflower is fully expanded and ready to help create a sustainable future. 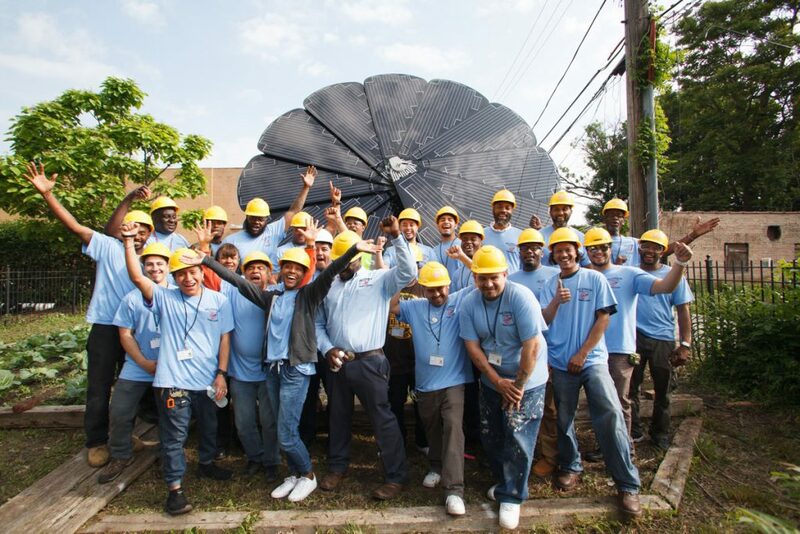 Millennium Solar graduates show excitement for the new smartflower! 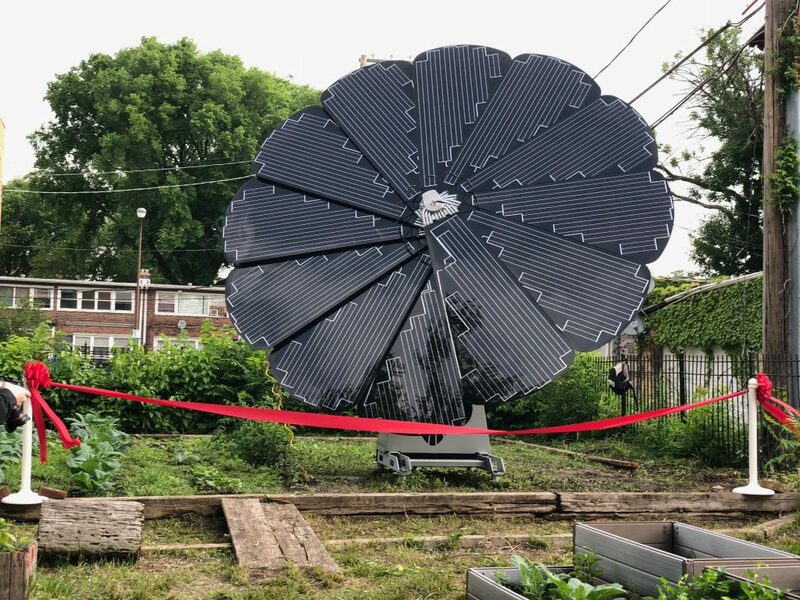 Mohawk Group donated the solar flower through our collaboration with Groundswell and Elevate Energy, among others, to benefit The Renaissance Collaborative (TRC), a non-profit organization that supports sustainable and affordable housing and related programming in Chicago. 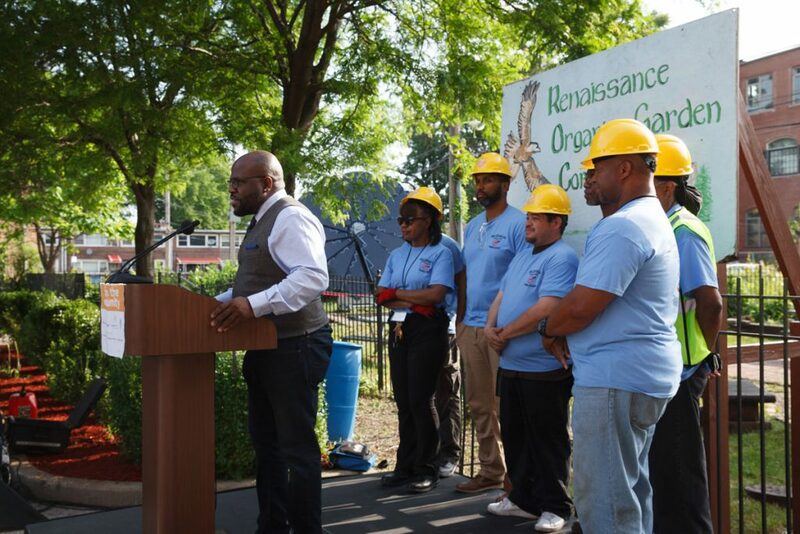 TRC’s offices and its Renaissance Apartments are housed in the restored Wabash Avenue YMCA, continuing the legacy of providing housing and job training in the Bronzeville neighborhood. 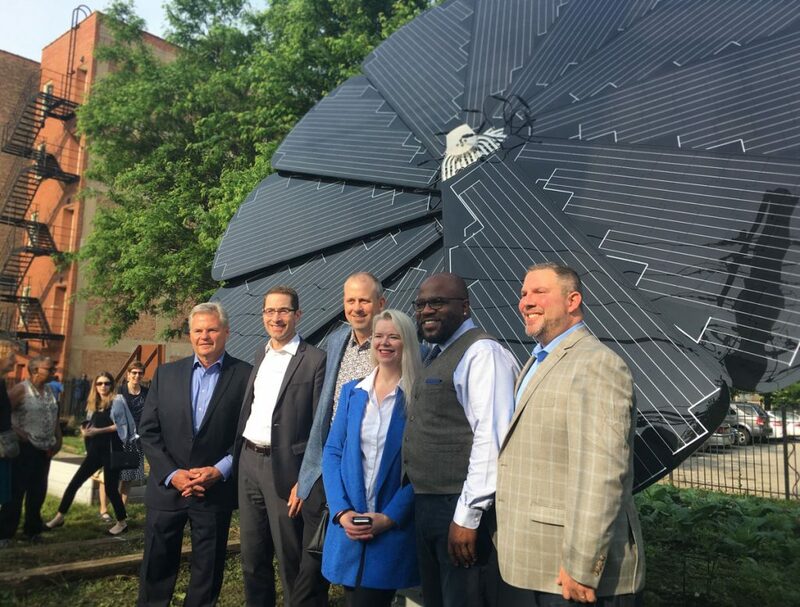 We were all excited to witness the unveiling of the smartflower along with other community partners such as iLumen, Eco-Solar Solutions, Millennium Solar and SunCatch Energy. 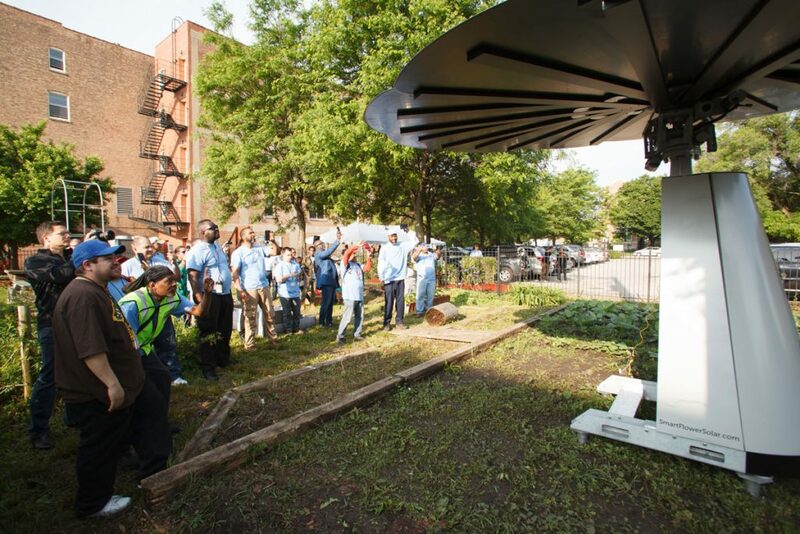 This was the first of solar flowers to be donated to underserved communities with STEM learning centers across the country during the next three years. The smartflowers will generate an energy savings of 3.3 million kwh to benefit the communities and to support and inspire future sustainability leaders. The electricity produced by the flowers will offset the energy used to create the five new Living Products that Mohawk Group unveiled at NeoCon. The new Living Products were developed to have a net-positive impact on the planet and its inhabitants as part of our Believe in Better commitment—creating beneficial handprints while eliminating environmental footprints. That’s why we partnered on our new smartflower program with Groundswell, a forward-thinking nonprofit organization that champions projects connecting solar power and economic empowerment through energy sharing programs. Each smartflower responds to the sun, opening its solar petals in the morning and tracking the sun throughout the day to convert the sunlight into electricity, and then closing at night. 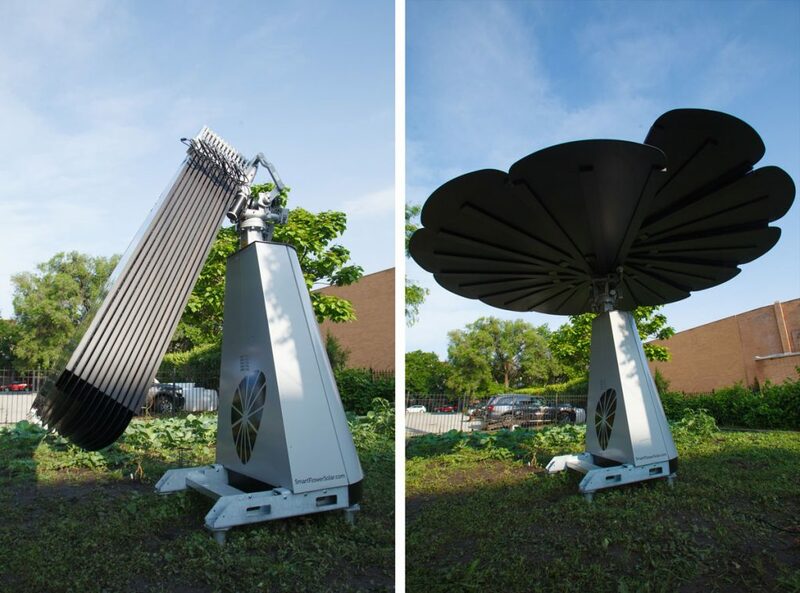 By following the sun’s rays, smartflowers generate 40% more energy than static solar panels. As a result, not only will the solar flower help offset our carbon footprint by creating environmentally friendly electricity, it will also create a perpetual series of handprints, helping to reduce utility bills in order to provide more resources that will benefit the Collaborative’s programming and help them further carry out their mission. Patricia Abrams, executive director of TRC, kicked off the smartflower celebration, expressing her gratitude for helping TRC further its mission to create cutting edge solutions for sustainable, affordable housing. Bandy was excited to officially kick off the innovative sustainability program. “I want to thank the Mohawk team and Groundswell for establishing opportunities to expand sustainability knowledge and solar opportunities,” he said. Unveiling the first smartflower held personal significance for him as well, taking place near his family’s hometown in Chicago. After outlining the social and environmental benefits of the smartflower initiative, Bandy also pledged to create a few additional handprints. He announced a commitment on behalf of Mohawk Group to send TRC’s graduating class of solar installers to the Greenbuild International Conference and Expo in Chicago in November. Greenbuild, the world’s largest conference dedicated to green building, includes a solar track. Attendance will give TRC graduates the opportunity to network with solar industry designers and manufacturers, potentially leading to permanent employment in their newfound careers. At Mohawk Group, we are dedicated to not only create environmentally responsible products that provide flooring solutions for our customers, but to do good for the communities where we live and work. We continually strive to Believe in Better, finding new ways to improve the world around us for everyone. *Thank you to Elevate Energy for capturing photos of the event!